SKU: ADOX. Category: Waxes & Polishes. 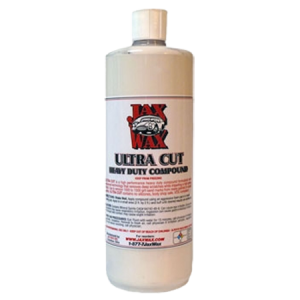 This is a very Hi-Tech chemical designed to clean and deoxidize ALL metal surfaces without streaking, hazing, burning or damaging the surfaces. Removes scale, road film, most acid stains and even rust on Chrome. It is the easiest and safest way to prep the metal before polishing. It really takes the elbow grease out of polishing. Can be used with most cream type polishes.If your aluminum has a milky look to it even after being polished: try Aluminum Deoxidizer before polishing, you will achieve a Crystal Clear Shine and will cut the time you spend polishing in half.Aluminum Deoxidizer is a very special acid-based chemical that strictly eats oxidation. It does not remove metal. It works on all metal surfaces. It will never burn or etch the metal. When using it on aluminum, no matter how highly polished the surface is, it will turn the surface white. Depending on how fast or slow the surface starts to turn white, or to what degree of whiteness, depends on how much oxidation is on the surface. The faster it turns white, or the whiter the surface gets, the higher the level of oxidation. When using this product, don’t be afraid of it. In some cases, if the metal is extremely oxidized or if you are dealing with some sort of an acid stain, you may need to totally white-out the surface. By doing this you will find that most hard to clean problems are no longer a problem. When you get done polishing your aluminum, is it crystal clear? Does it sometimes or all the time have a little bit of a milky film or a milky haze deep underneath the shine? 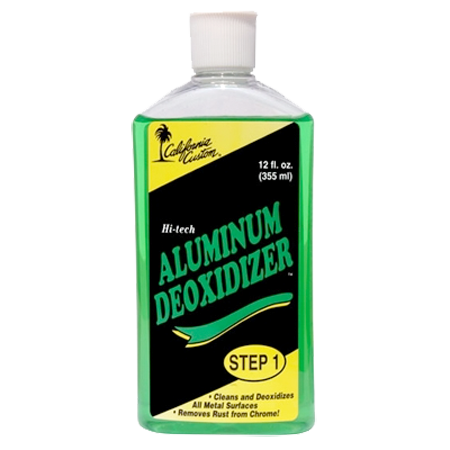 If it does, then you need to use the Aluminum Deoxidizer. By using the Deoxidizer first to clean the surface, then applying the Purple Metal Polish directly over the top of the Deoxidizer, when you buff the black residue off, your metal will be crystal clear. Highly polished aluminum should look just like chrome. With so much stuff on the roads these days, the abundance of vehicles along with various chemicals that are sprayed on or near the roadways, it takes a liquid chemical to help clean all that stuff off before you polish. 3. Apply Purple Metal Polish and Buff to Incredible Shine. 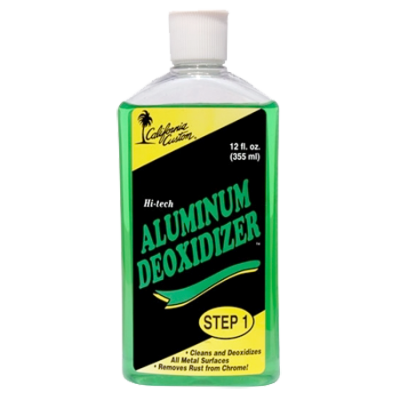 Be the first to review “Aluminum Deoxidizer” Click here to cancel reply.